Zombies and scary ghouls are not exactly any parent's idea of a family-friendly Halloween experience but over at Resorts World Sentosa's S.E.A. Aquarium, the marine realm is set to endear Halloween celebrations to the little ones with its S.E.A. Aquarium Wonders: Spooky Seas edition. In keeping with the spooky theme, the Aquarium will be decked out in Halloween-themed decorations, from special skeletal diving suits on its divers to special props in the huge tanks with bones and pumpkins! What's Halloween for the kids without fun and exciting activities? 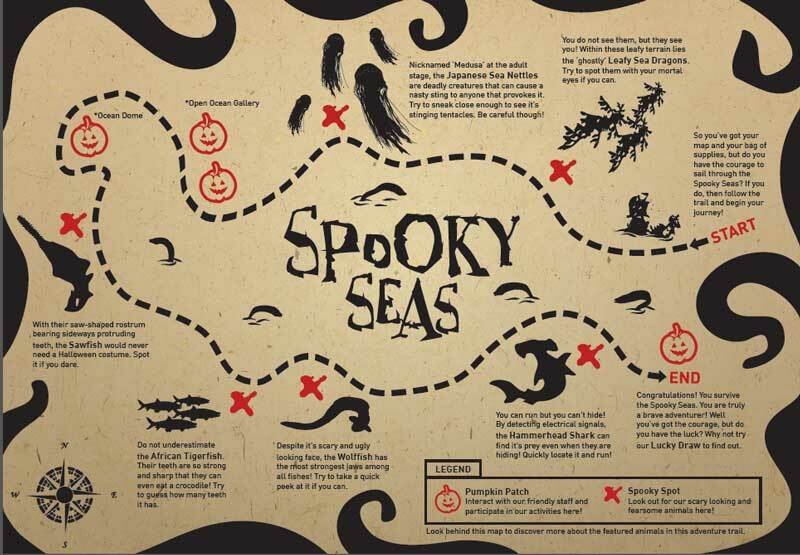 Every child who visits between 1 October and 16 November 2014 will receive a special Spooky Seas Adventure Trail activity sheet which contains 12 stations, 12 amazing facts and 1 great educational adventure all rolled into one! During the weekends, kids will also get the chance to make their own Trick-or-Treat pumpkin bags and collect treats along the way, while completing tasks in the Adventure Trail at the same time. Nothing like chocolates and sweets to get the monkies all pumped up for a spooky adventure under the sea! Through 12 activity stations across the aquarium, the Spooky Seas Adventure Trail took us around the Aquarium and introduced us to seemingly scary animals ranging from the Leafy Sea Dragons and Japanese Sea Nettles to the Wolffish and Hammerhead Sharks! Scary actors from under the sea they are not, but hunting them down in the Aquarium allowed the monkies to learn more about these often misunderstood species. Yes, of course the promise of free candy does not hurt as well. We popped by the Open Ocean Gallery too, where the monkies had the chance to learn more about S.E.A. Aquarium's newest marine resident, the Largetooth Sawfish. The Largetooth Sawfish has just arrived and is listed as critically endangered on the International Union for Conservation of Nature’s (IUCN) red list of threatened species. Be sure to see if you can spot him (or her?) at the Open Ocean Habitat! Oh, and one stop that the kids will not mind stopping over is the Ocean Dome where they will be able to collect their very own Hammerhead Shark Party Hat. If you wish to enhance your S.E.A. Aquarium experience, I will strongly recommend the going with the S.E.A. Aquarium VIP Tour. Not only did the monkies benefited from the company of a guide, who filled them in on the fascinating facts of the marine animals, they also enjoyed priority access to some of the Aquarium's attractions. But that was not all. We even had privileged access to back-of-house areas, where we got to participate in the feeding of marine animals in the Open Ocean Habitat tank and also had the exclusive opportunity to witness the breeding of the many types of jellyfishes behind closed doors! The Guided VIP tour takes approximately 3 hours in total, and includes a Dolphin Island back-of-house tour as well. Check out the full benefits and costs of the tour HERE. Back to Spooky Seas, and the monkies were bent on collecting the final chops to their trail maps so as to redeem their prizes at the Prize Collection Stop. Do keep your eyes peeled if you are there on the weekends as there will be roving Meet & Greet sessions involving special Halloween sea characters, like the Mermaid Witch, Sea Jelly Spirit and Sea Horse Dracula. Yes, all in a morbidly cute sort of way... but this is one Halloween fun that everyone in the family can enjoy together! What better way to learn about fish than from the people who take care of them? The Aquarium's aquarists will be sharing awesome information on scary-looking marine animals, with topics such as: Venomous Animals, Camouflage and Animal Defense. First ever footage of the legendary Giant Squid, as well as other rarely seen deep sea animals. A 60-second feature of some of the strangest looking animals at S.E.A. Aquarium, including the vampire-like wolffish, African tigerfish, and powerful sawfish. Win a Trip for 2 to USA! Purchase 2 S.E.A. Aquarium passes and stand to win a trip to catch “MythBusters – Behind the Myths” in Los Angeles! In addition, each month, four lucky winners will also stand a chance to walk away with a free session of our Ultimate Marine Encounters programme and have an up-close encounter with our marine animals. For more details, visit HERE. Win prizes worth up to $476! Take your best spooky themed photo or video at S.E.A. Aquarium during the SEAA Wonders: Spooky Seas month. Visit HERE for more information on how to take part.